Residential fire sprinkler systems have a range of components, and the complexity of any given set-up depends on several factors, including if the system is standalone or multipurpose; the water supply to the sprinklers and whether it naturally provides sufficient pressure; the pipe used; and any requirements of your local or state government. In part one of our series covering the installation of home fire sprinklers, we introduced how these systems work, explained the two major types of home systems and provided guidance on finding a qualified installation contractor. In this piece, we will begin to review the major components of residential fire sprinklers, including special considerations that homeowners should be aware of when installing a system. Before reading further, are you simply interested in purchasing components for a home sprinkler system? Feel free to jump directly to QRFS’ selection of residential sprinklers or use the search bar at the top of the page. 6.1.1 Every automatic sprinkler system shall have at least one automatic water supply. NFPA also outlines five potential sources of water for a residential system, but the choices usually boil down to three major categories: the municipal water supply, a well, or some type of tank that exclusively stores water for the sprinkler system. One of the first things an installation contractor will do when evaluating an existing residence or new home site is check the pressure of the city water supply (if there is one), as this is the default option to supply a fire sprinkler system. This may simply involve placing a pressure gauge on a hose outlet and turning it on. If the water main doesn’t deliver sufficient pressure (about 100 psi is a very safe number), the contractor will have to look at alternate options, whether that involves adding a pump to boost the pressure of the city water or using an elevated tank, a pressure tank, or a standard tank with a pump. If a tank is necessary, this typically means the homeowner will install a standalone system rather than a multipurpose system. Homes that are only served by wells will likely use that water source with the aid of a pump, and well systems with sufficient pressure could service both multipurpose and standalone systems. It is also possible to use a separate tank if the home is served by a well. When city water is the source, local regulations often require a water meter to measure water usage plus a backflow preventer, which is a one-way valve that prevents the standing water in the sprinkler system from making its way back into the potable water supply. Unfortunately, each of these additional parts adds friction that reduces available pressure in the system. Thus, a fire sprinkler contractor must install larger water taps and meters (of at least 1”) to minimize this impact, and account for the presence of these devices in the hydraulic calculations for the system. In addition, “some water utilities insist on separate taps and supply pipes from the water supply to the dwelling unit for fire sprinkler systems … due to concerns about shutting off the water supply for nonpayment of bills and the desire not to shut off fire protection if this ever occurs.” Check your local requirements. NFPA strongly discourages governments from requiring separate supply lines. The organization cites the potential health and safety issues of shutting off any water supply – whether it serves a fire sprinkler or regular plumbing – plus the fact that separate supply lines vastly increase the cost of sprinkler installations. Be sure to follow NFPA Code and local guidelines when using a home fire sprinkler pump. (1) A test connection shall be provided downstream of the pump that creates a flow of water equal to the smallest sprinkler K-factor on the system. (3) Any disconnecting means for the pump shall be approved. (4) The pump shall be located not less than 1.5 in. off the floor. Having a test connection is specified in the pump requirements because it basically verifies that the pump is doing its job. If a pump is used in conjunction with a tank in a standalone system, the test connection should ideally be designed to return the test water to the tank, so it stays full. According to NFPA, the 240-V requirement is in place because “experience has shown that 240-V rated pumps reduce the likelihood for the pump to draw excess amperage, which can result in the tripping of associated circuit breakers in the electrical panel and cause the pump not to operate.” This electrical requirement actually applies to all pumps, not just those used in standalone systems. And keeping the pump 1.5” off the floor is simply intended to make sure standing water can’t short circuit or otherwise interfere with the pump. There are a variety of manufacturers that make relatively inexpensive pumps which meet these standards. The major classifications of home fire sprinkler heads govern where the heads are placed and how they operate: pendent, upright, and sidewall. Within those categories, a sprinkler can be concealed or exposed, and have an ordinary or intermediate temperature rating. There are other variations of sprinkler heads, like sprinklers that are required for “dry” systems or other varieties for special locations like saunas, steam rooms, and mechanical closets – but the overwhelming majority of residential fire sprinkler systems are “wet” (water is always in the pipe) and those special areas often do not require sprinkler coverage. A typical pendent fire sprinkler head. Pendent fire sprinkler heads hang from the underside of pipe that delivers the water. These are installed in ceilings and use a defector that sprays the water downward in a circular pattern. An upright fire sprinkler head that could be used in a residential application. Upright sprinkler heads sit upright from the supply pipe. These are more often seen in commercial applications, though they can be installed in a home; they are “used mostly in places where obstructions may block water spray during a fire, and their height allows them to aim water around possible obstacles.” They can also provide coverage in spaces where there is no place to run the pipe up the walls or in the ceilings. A horizontal sidewall sprinkler rated for residential use. Sidewall sprinklers, as you’ve probably guessed, jut from a vertically-running pipe and the sides of walls. They have a deflector that sprays the water in a crescent pattern at an angle. Sidewalls are installed in areas where they may be a better option than pendent sprinklers. For example, they may be used in the uppermost floors of a house to avoid having to run pipe in an attic subject to freezing temperatures, or in other rooms where pipes can’t fit into the ceiling. A concealed pendent sprinkler with a cover plate that hides the sprinkler head. Concealed sprinklers use an aesthetically pleasing cover plate that is sensitive to high temperature. Once the plate senses a certain temperature, it drops away and the sprinkler head is exposed. An essential warning when using concealed sprinklers is to never paint over the cover plates, as dried paint over the seams will cause them to fail. Sprinklers heads with an ordinary temperature rating deploy when the temperature around the trigger reaches 135°F to 170°F (57°C to 77°C). Sprinklers with an intermediate temperature rating deploy when the temperature reaches 175°F to 225°F (79°C to 107°C). There is also the option to move ordinary temperature-rated sprinkler heads farther away from any heat sources in a room, and NFPA 13D outlines minimum distances from these hot spots to avoid accidental discharge. How many fire sprinkler heads are necessary? The most important thing to know is NFPA 13D’s overall guidance, which recommends “sprinklering of all areas in a dwelling” but does not require it. Essentially, sprinklers only need to cover rooms of a certain size that are considered living areas. Standard sprinklers cover a 12’ x 12’ area and extended coverage sprinklers cover a 20’ x 20’ area, and each head must be placed at least 8’ apart; thus, many rooms will only need one or two sprinkler heads. 8.3.2 Sprinklers shall not be required in bathrooms of 55 ft2 (5.1 m2) and less. 8.3.4* Sprinklers shall not be required in garages, open attached porches, carports, and similar structures. 8.3.5 Sprinklers shall not be required in attics with or without storage, penthouse equipment rooms, elevator machine rooms, concealed spaces dedicated exclusively to and containing only dwelling unit ventilation equipment, floor/ceiling spaces, elevator shafts, crawl spaces, and other concealed spaces that are not used or intended for living purposes. 8.3.6 Sprinklers shall not be required in covered, unheated projections of the building at entrances/exits as long as the dwelling unit has another means of egress. 8.3.8 Sprinklers shall not be required in closets in garages and exterior closets (regardless of size) located on exterior balconies, exterior breezeways/corridors, or accessed from outdoors where the closet does not have doors or unprotected penetrations directly into the dwelling unit. 8.3.9 Sprinklers shall be installed in any closet used for heating and/or air-conditioning equipment, washers and/or dryers, or water heaters except as allowed by 8.3.8. Despite those guidelines, your local government may require additional coverage in some or all of these areas. Be sure to check your local codes and hire a knowledgeable installer who has experience navigating them. View residential fire sprinkler from QRFS! 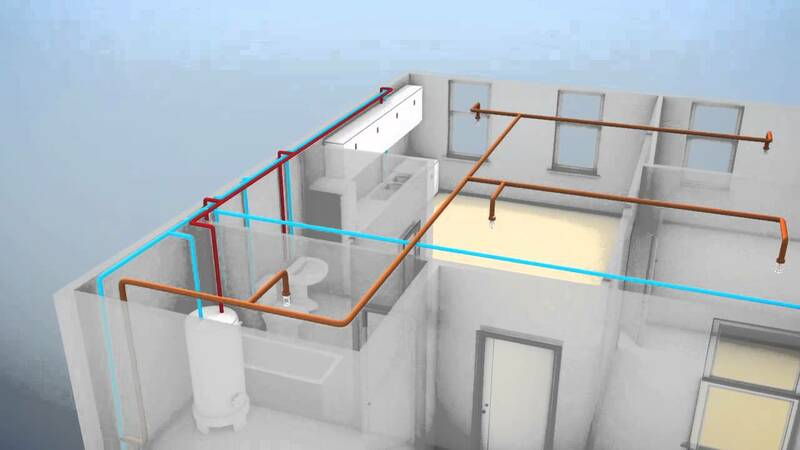 In the next installment of this series, we round out the major system components of a home sprinkler system, exploring the pipe options that can be used in standalone and multipurpose systems. If you have any other questions about residential fire sprinklers or need help finding an item, add a comment below, give us a call at 888.361.6662, or fill out our contact form.